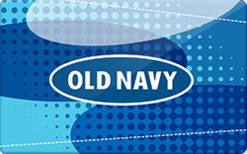 OldNavy gift cards work at Old Navy, Gap, Banana Republic, Athleta and Piperlime. They work on both in-stores and online on oldnavy.com. Buy a discounted gift card to save on top of coupons and sales. Giftcards work like cash.